nicely [always lower case] set the psych world on its ear back in 1982 (or was that 1892?) 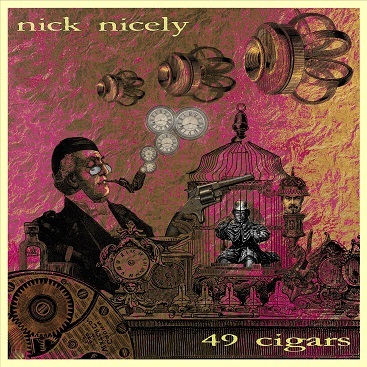 with the strangely strange and slightly dyxlesic [sic] 45, ‘Hilly Fields (1892)’, coupled with the even weirder ’49 Cigars’, featured here in all its wacky finery: surreal lyrics, ‘Strawberry Fields’-meets-‘Tomorrow Never Knows’ riffage, backwards guitars, and assorted kitchen sink effects. All is fine and dandy until nicely’s neighbours pop in for a chinwag and the ensuing silly voices and awkward improvisational conversations turn it into Monty Python on holiday with The Goons. Shame. nicely remixes ‘Belinda’ (originally on his 2011 cassette-only Lysergia), but still buries a pretty melody under a barrage of fx, electronics, and more left-turns and detours than the M1 under construction. The flip opens the title track up for a live knockabout that suggests nicely may have even more toys on stage than in his studio. Imagine a chance meeting on a dissecting table of Einstürzende Neubauten and Faust …and then take away the table. Before it ends (or more accurately implodes), an operatic soloist a la Klaus Nomi wanders onto the playing field, only to be ushered aside by some nasty soloing and a few footie cheers…or was that the audience? Bitchin’ drummin’, though! The grind ends with the eerie ‘Lobster Dobbs’ (also on earlier releases), another hazy nightmare with an industrial-sized stalking beat, throbbing bass, and haunted, distorted vocals singing something about a roach…I think…. You'll probably not hear anything like this for a long time. I'm just not sure if that's good or bad.